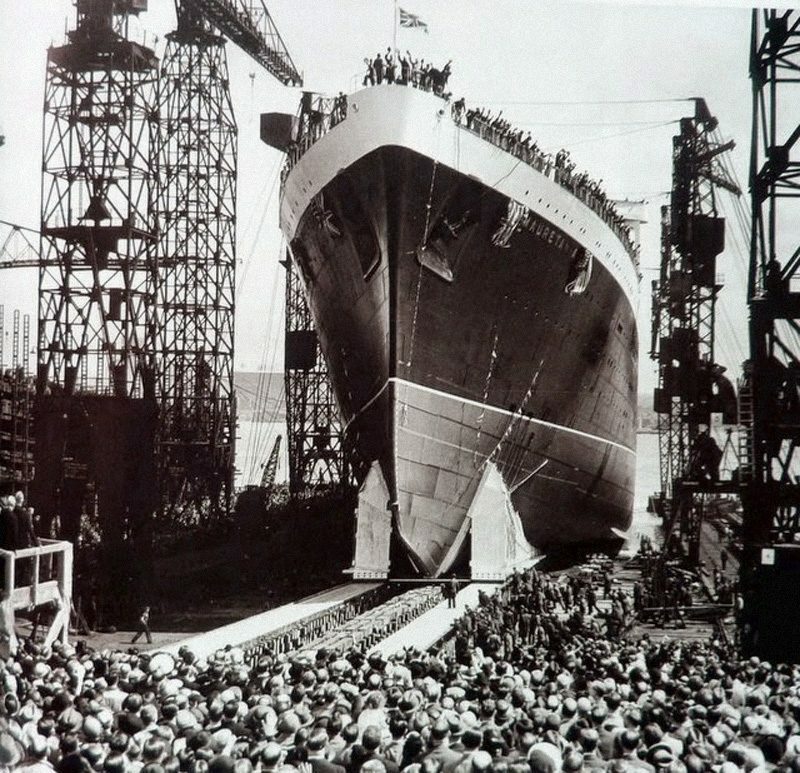 The launch of the second Mauretania. The new Mauretania arrives in New York. The second Mauretania had a profile similar to that of the larger Queen Elizabeth. The interiors on the Mauretania were, like on the Queen Elizabeth, done in a late Art Deco-style. 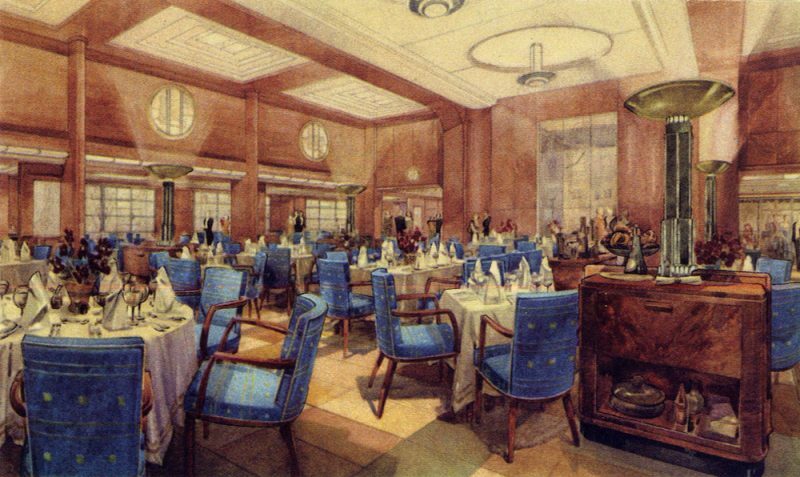 This promotional artwork shows the first class restaurant. Painted grey, the Mauretania was called in as a troop transport in World War II. A photo of the Mauretania during her later years, painted in a green-hull cruising livery similar to that of the Caronia. 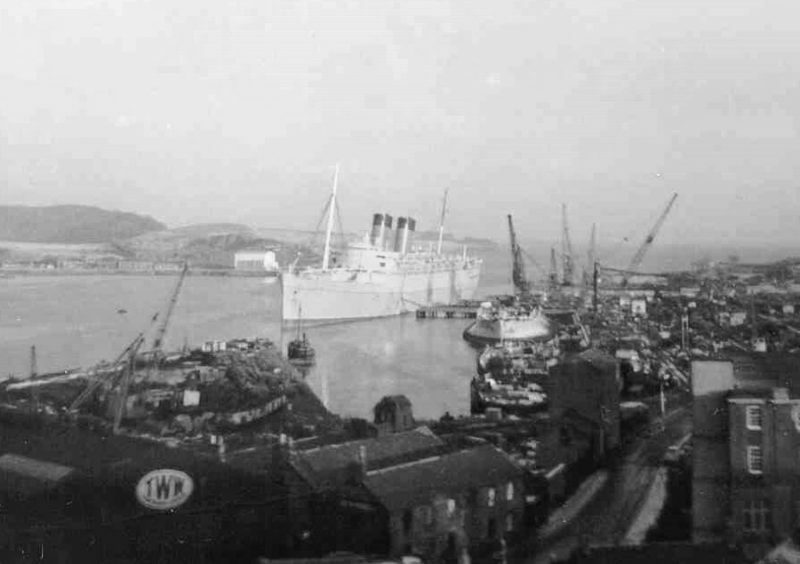 The Mauretania at Inverkeithing, where she would be broken up. After decades of prosperous transatlantic business, the shipping companies were faced with great financial troubles when The Great Crash occurred in 1929. Times became so bad that the two former rivals Cunard and White Star Line were forced to merger in 1934, forming the Cunard White Star Line. Thereby they were granted with much needed government subsidies to finish the ship Cunard had started to build back in 1930. So far only known as ‘Hull 534’, this great ship would eventually become the legendary Queen Mary. But although the Queen Mary could now be finished, it did not mean that the hard times were over. 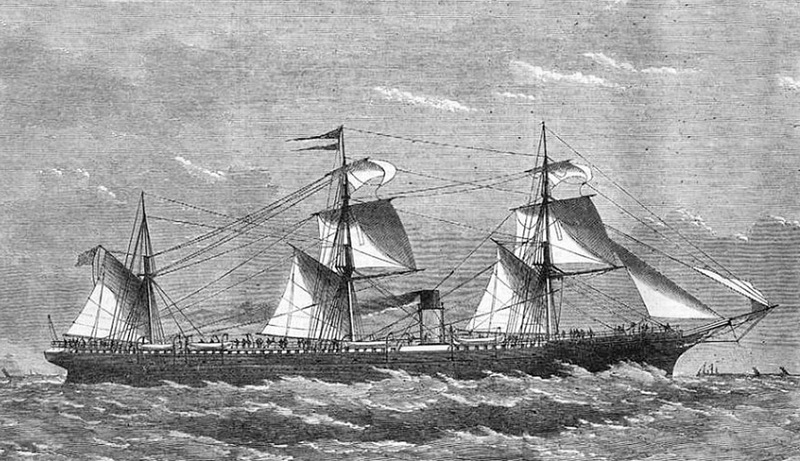 Cunard White Star did not have the money to build more new ships, and were forced to rely on their old vessels. It would not be until 1937 before a new ship could be built for the company. 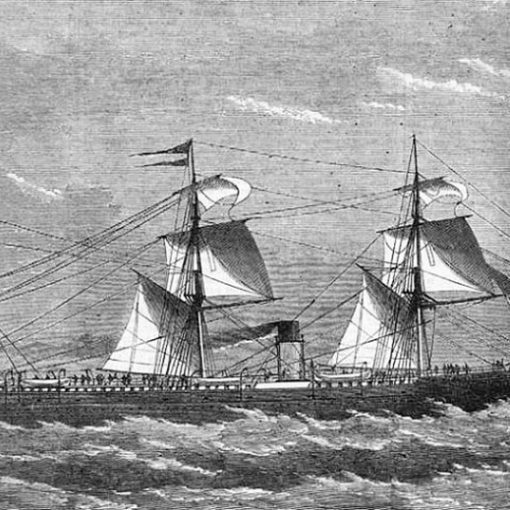 With economics recuperating, Cunard White Star ordered their first new ship from the English shipbuilding firm of Cammel, Laird & Co. Ltd. The keel of the new ship was laid down on May 24th, 1937 and was at the time the largest ship so far to be constructed in England at a projected gross tonnage of over 35,000. It is true that bigger ships had been built before in the United Kingdom, but then either in Scotland or Ireland. After a little more than a year of work, the first Cunard White Star vessel was ready for its launch. 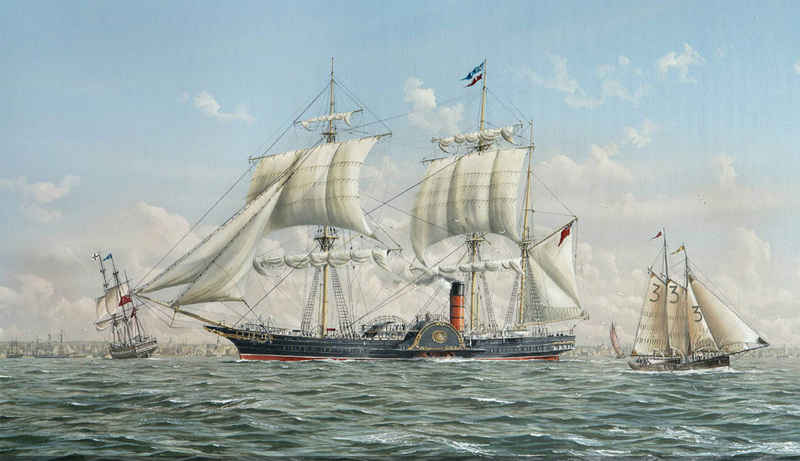 The honour of christening the new ship was given to Lady Bates, wife of the company’s chairman. 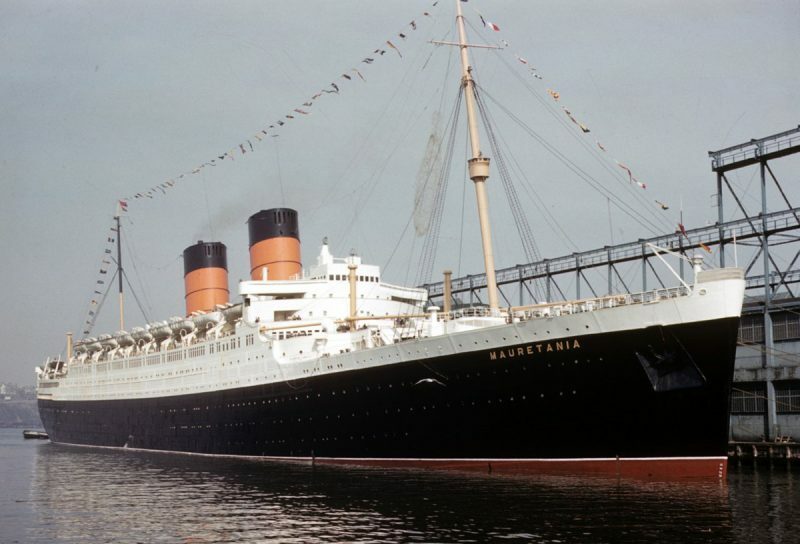 On July 28th 1938, she named the ship Mauretania, a name that naturally brought the legendary Blue Riband-holder to everybody’s mind. 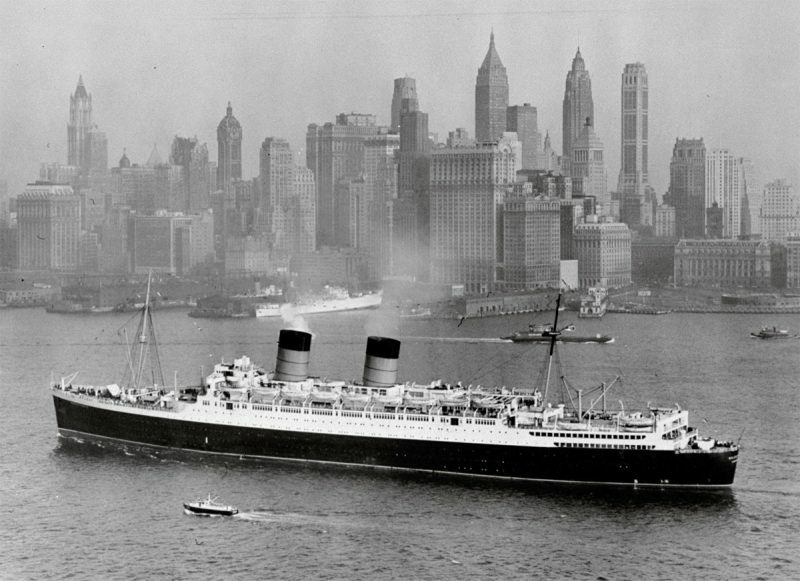 The new Mauretania made her maiden voyage from Liverpool to New York on June 17th, 1939. After a weeks turnaround in The Big Apple, the Mauretania returned with Southampton as final destination. Following her next westbound crossing, she called at Southampton, Le Havre and finally London on her return trip. The Mauretania was the largest ship ever to navigate the Thames and use the Royal Docks. But after only a mere two months of commercial service, Hitler’s German Reich invaded Poland and set off what would become the Second World War. The Mauretania was requisitioned by the British government and painted in war-time grey. She was also armed with two six-inch guns and then sent to America before the first year of war was over. During the first three months of 1940, the Mauretania lay in New York, for a short time accompanied by the three largest ships in the world – The Queen Mary, the Normandie and the new Queen Elizabeth who had just made her secret maiden voyage dash across the North Atlantic. On March 20th 1940, the Mauretania left New York for Sydney, Australia via Panama. There she would be converted into a trooper. The following day Queen Mary left New York for the same purpose, and the two ships were ready for war duties two months later together with the World War I veteran Aquitania. At first the Mauretania would be used for shipping troops from Australia to Suez, India and Singapore. But as the war raged on in Europe, the Mauretania would later transport soldiers across the North Atlantic, along with the two mighty Queens. The times of war went more or less uneventful for the Mauretania, not counting a minor collision with the tanker Hat Creek. 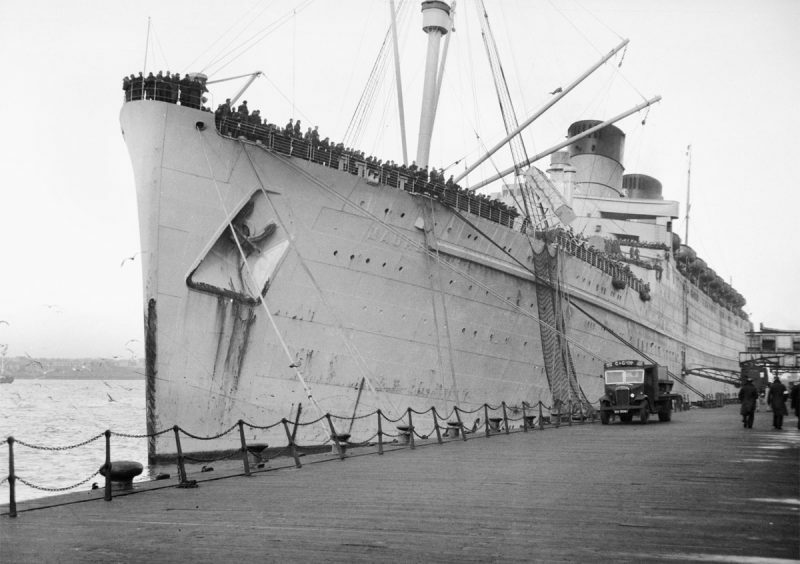 In 1945 the war ended, but the Mauretania was kept on to transport soldiers back to their home nations. But on October 2nd 1946, she was released from government service and returned to Liverpool, where she would be reconditioned by her builders, Cammel, Laird & Co. The Mauretania was given a complete overhaul and was returned to commercial service in 1947, making her first post-war crossing on April 26th. 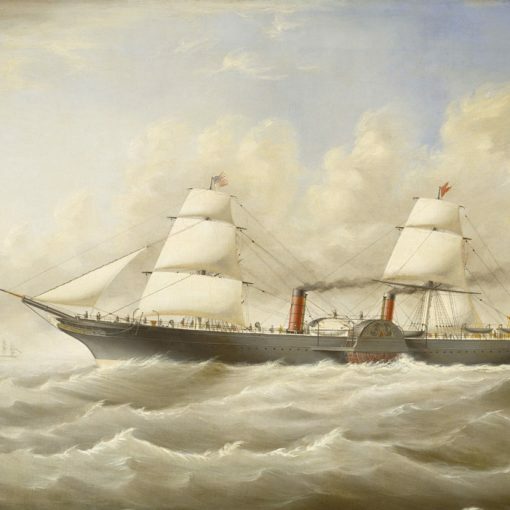 The two first round trips were from Liverpool to New York, and the ships route was then changed to Southampton-New York instead. The Queen Elizabeth, which had only made wartime crossings since her completion in 1940, had by now commenced her passenger service alongside the Queen Mary, thereby fulfilling Cunard’s dream of a two-ship weekly express service across the North Atlantic. Observers with a keen eye could see that the Mauretania was more or less a smaller replica of the second Queen. It was not only her two-funnel exterior that made them alike, it was also the late Art Deco-style interiors that brought them together. The Mauretania was often rightfully called the Queen Elizabeth’s ‘first cousin’. The two Queens maintained Cunard White Star’s transatlantic express service, with the Mauretania operating as a relief ship, making transatlantic crossing when she was needed. 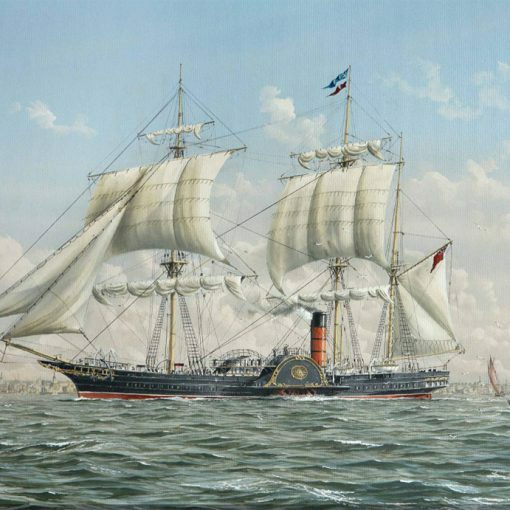 Otherwise she sailed every three weeks calling at Southampton, Le Havre, Cobh and New York. Beginning in 1947, the Mauretania was also used as a part-time cruise ship in the winter season, making voyages to the West Indies and the Caribbean. Such ‘dollar-earning cruises’ became an important part in rebuilding the British economy. 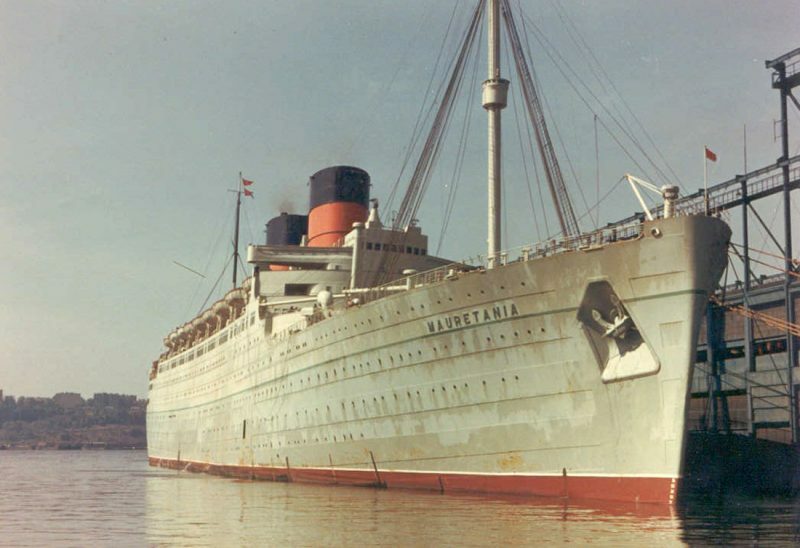 But with so many others of the great liners, the Mauretania was faced with bad times when the airlines introduced themselves on the North Atlantic in the late 1950s. The ships atmosphere was improved in December 1957, when she was fitted with complete air-conditioning during her annual overhaul in Liverpool. But her services on the transatlantic run were soon becoming surplus, with her often carrying no more than a third of her total capacity. In 1962 the Mauretania made no profits for her owners, and so it was decided that she would be used almost only for cruising. She was painted in light green, like the Caronia, giving her a more leisurely look. Her passenger capacity was reduced a little to make her more suitable as a cruise ship. The following year, on March 28th 1963, she started her new Mediterranean service between New York, Cannes, Genoa and Naples. But this was a new route for Cunard and the competition was hard. The Italian Line’s Leonardo da Vinci and Cristoforo Colombo stole almost the whole clientele, and Cunard soon returned the Mauretania to her old service in the Caribbean. 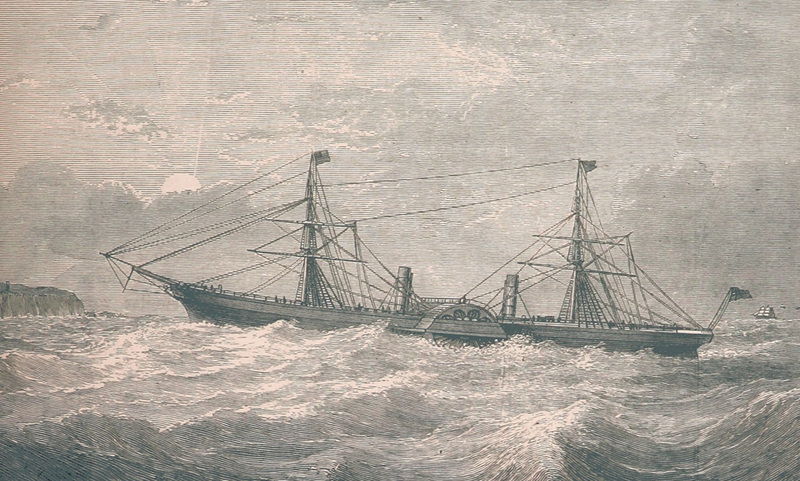 She made periodic appearances on the transatlantic run, but spent the most of her time cruising in warmer waters. The 1960s were hard times for Cunard, and they saw almost their entire fleet disappear; even the legendary Queen Mary was retired in 1967. The Mauretania was no exception. Her final voyage was a Mediterranean cruise from New York on September 15th, 1965. While away, Cunard announced that she was to be decommissioned and sold to the highest bidder. Before Mauretania arrived in Southampton on November 10th, a company had already made the highest bid. Her buyer was the British Iron and Steel Corporation. 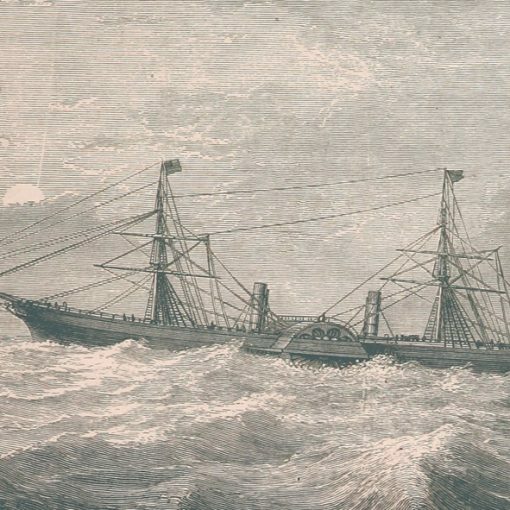 A few items were removed while the ship was in Southampton, and she was then taken away. On November 23rd the Mauretania arrived at Ward’s shipbreaking yard in Inverkeithing, Scotland. There she was cut up during the years of 1965 and 1966. 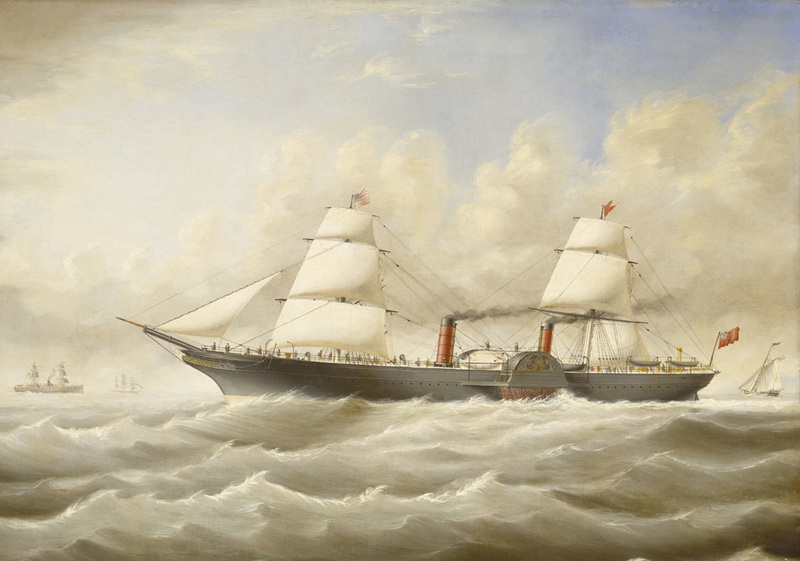 1867 – 1902 / Also known as Waesland / Catching up with modern technology of the time, the Cunard Line launched the Russia as their first ship built with a propeller rather than paddle wheels.